Note: the providential priest, Fr. Peter Tran, was born a French citizen in the *capital city of Indochine française (French Indochina), a protectorate of the Kingdom of France. *Hanoi was made capital of Tonkin and in 1901, of the union of French Indochina that consisted of all the French colonies in Southeast Asia. Cities in Tonkin saw significant infrastructure and economic development under the French like the Trans-Indochinois Railway linking Hanoi to Saigon. Under French economic plans, mines yielding gold and silver, as well as the farming of rice, corn, and tea powered Tonkin's economy, which were exported throughout the French Empire. French cultural influence on Tonkin was also significant as French became the primary language of education, government, trade and media and heavy Catholic missionary activity resulted in almost 10% of the population identifying as Catholic by the 1940s. Traditionally the Vietnamese have had a great devotion to Our Lady. When Fr. Peter Tran met with Pope Gregory XVII in June 1988, in Rome, they spoke to each other in French. His Holiness and Fr. 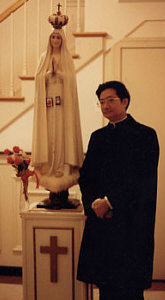 Peter Tran spoke about the true Fatima message and how "the Great Apostasy began at the top" i.e., with the Revolt at the 1958 Conclave and the captivity/suppression of the pope. They also spoke of how to best bring about the Triumph of the Immaculate Heart. *Gregory XVII noted the significance of Fr. Peter Tran's French background, too. *May 20th (1906) was the birth date of Giuseppe Siri (Pope Gregory XVII). Wishing a most Happy Birthday to Fr. Tran today!